You have a lot of party preparations to worry about. 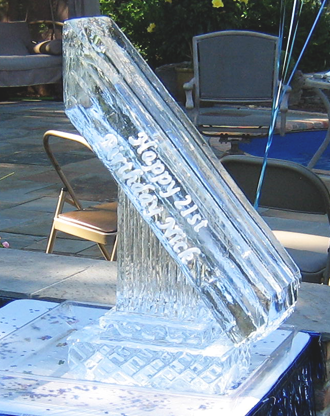 Rely on Ice Luge Doctor to take care of the entertainment and decorations simultaneously with one of our amazing ice vodka luges. With more than 15 years of experience, we provide dependable service in Long Island, New York, as well as in New York City. Ice Luge Doctor has everything from an outstanding ice bar and a sculpture with a corporate logo to a beautiful wedding display and a fun shot luge. 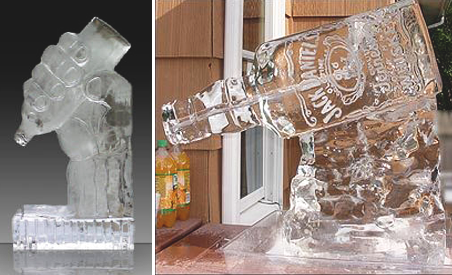 Any sculpture that we make can be converted into an ice luge. We put a modern twist on classic ice sculptures, transforming our art into a fun, interactive party favorite. We help get parties started throughout Long Island, New York, Manhattan, Brooklyn, Queens, the Bronx, Staten Island, Westchester, and New Jersey. Our standard luge is recommended if you want to host an interesting party in which your guests take direct shots from the ice luge. Lasting more than six hours with direct use, it is 35" tall by 20" wide by 10" deep, and it has two paths for the alcohol. Our standard luge can even be used for upscale weddings and events where the bartender works the alcohol into a martini glass. Contact us for more suggestions.